Many researchers have walked through our doors over the years. Their interest has spanned from Fair Trade to the lives of the artisans. We support all research that will add to the world wide knowledge of anything related to our business. We are happy to connect researchers to artisans and to allow researchers into our business to see how we work. We have had a number of time wasters too that have walked through our doors, those that were too busy organising trips to see gorrillas than learning about their supposed research topic. Breezing in and out of our offices wanting us to lay down our pens to have a chat with them when they are not taking notes. It may be Africa but we are not all on holiday. We therefore have had to become a little stricter. We require a letter from your supervisor recommending you to us which should notify us of minimum interviews or working research hours required. We need a full research proposal with aims and expectations and we also need a C.V. We are always curious as to how you found us which should be stated in your first letter or email to us. This for any serious researcher should be no problem. Occasionally we've had researchers that encounter some culture shock and we would ask their supervisors to advise them before they travel. All researchers must adibe by the rules and guidelines set out by the Ugandan government on research. One of our previous researchers was required to obtain a researcher licence which she organised herself before arrival. We are not sure whether this is required by Immigration or the atuthorities in the University of origin. We expect researchers to bring and to submit the necessary paperwork for the appropriate visa to immigration in the case that their research will keep them in the country for 30 days and over. We advise researchers to find out about immigration issues before arriving in Uganda to avoid unnecessary hassle and time wasting. For other information on accommodation etc please read our 'Volunteer' section on this page and then contact us directly. Lastly but not least we ask all visitors to respect our Ugandan ways and culture. We are friendly and we love making friends but we do things differently as things run differently here than they do in the West. Do not be so quick to judge. First impressions can change into something you didn't expect. If you listen a lot and learn, you will get a true insight into Uganda and Ugandans which will benefit you greatly. We want you to learn and to go back to your country with a greater understanding. We know that you are the ambassadors and you will tell your friends, neighbours and collegues about the true nature of Africa. Researchers you are most welcome to Uganda Crafts 2000 Ltd.
Uganda Crafts 2000 can run a craft skill training course for you. We look forward to working with organisations that wish to host and fund a training project for a community group or individual. When we get external and internal funding we channel that into training courses for interested groups with little funding and for exisiting artisans that work for us. Please contact us directly by telephone to set up a meeting to discuss your tailored price quotation. 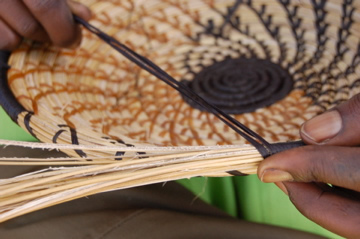 Our most successful training has been the community weaving training project known as “Suubi Weaving”. All Suubi weaving courses aim to provide training in basket weaving to skilled artisans and to unskilled people in order to increase our production capacity. ‘Suubi’ is the Luganda word for ‘hope’. Weaving provides hope as it is a valuable source of regular income. Those that come with no knowledge of basket weaving will leave with the skills to harvest materials, prepare materials, dye materials and weave baskets. We will also workshop with them on money management, accounting, Fair Trade principles and life skills. Those that are already skilled will be trained in basic book keeping skills, dying and colour mixing, new methods of weaving, product innovation and quality control. Where there is a request for training in Batik making, learning how to make bark cloth, leather making and recycled paper necklace training we usually connect the organisation directly to an artisan that is willing. We don't feel it's fair to intermediate and therefore charge an administration cost when the trainer/ artisan will already be charging highly. We will give advice if there are any likely challenges you will face before we connect you. The craft industry is geared towards tourists and now more and more tourists not only want to buy crafts but to see how they are made. Like many Fair Trade organisations we like visitors to come and take an interest in our artisans, the culture and craft production. In most cases these visitors are journalists, buyers or academic researchers. We have provided a wide range of learning tours such as the BBC correspondent that wanted to make leather sandals and textile researcher that wanted to make bark cloth. Usually the groups are one or two people but in 2007 we hosted 13 visitors from Ten Thousand Villages US and Cananda. They learned how raffia is harvested and then spent an challenging but fun afternoon making a key chain out of raffia. On request we can set up a visitation to an artisans home where you can interview the artisan and learn how to make the craft (if you can). Uganda Crafts 2000 do not charge a fee for this service, however the artisan will charge for their time. Time is money and any time away from making their craft is money lost. There may be additional charges in some cases for a translator, lunch, craft materials, fuel and transport. All costs will be agreed with the visitor before the visitation and sometimes an advance will be needed. Cancelation of visitation can lead to a loss of this advance and we ask visitors to cancel a visitation or service (i.e.translator) at least 48 hours before the due appointment. 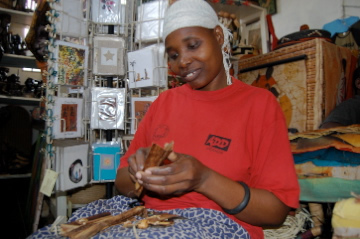 For the artisans you visit you are not a customer but a new friend. They love to see photographs of where you are from and your family and they love when you post them the photographs you have taken of them to remember your visit with them. It's an extremely non commercial experience- a day, days or an afternoon you and they will always remember.